Nepal and SAVE witnessed a further landmark for Asian vulture conservation on 17th September 2018, when the Government of Nepal and national and international conservation organisations released 12 critically endangered white-rumped vultures Gyps bengalensis, including the first eight birds actually hatched within the conservation breeding programme. Releases last year of birds reared (but not hatched) in the programme have so far shown very promising signs of survival and success, and in addition, 20 wild birds have now been satellite-tagged - 11 in 2017, and a further 9 just prior to this release. 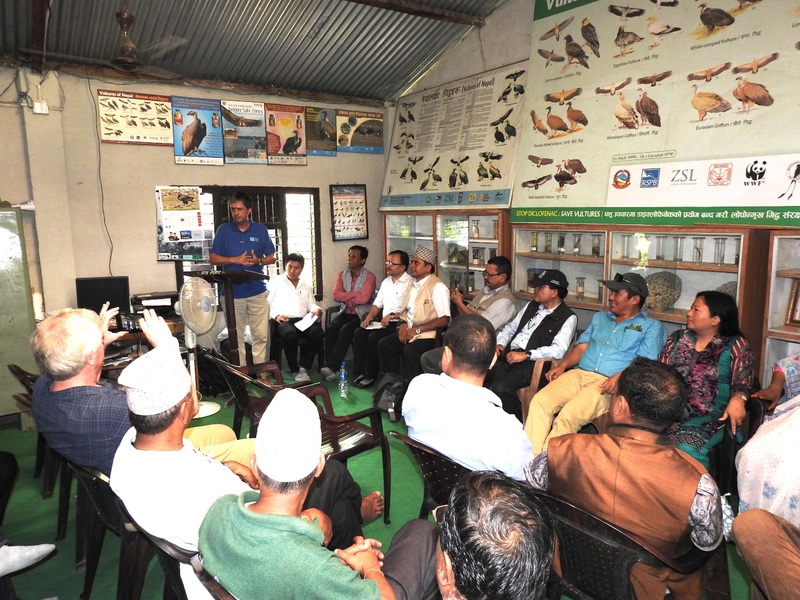 The work is a truly collaborative effort of many partners, led by Bird Conservation Nepal (BCN) and the National Trust for Nature Conservation (NTNC) together with Chitwan National Park and the Department of National Parks &amp; Wildlife Conservation (DNPWC). The Director General of DNPWC and a small group of officials, scientists and community leaders watched as the BCN team quietly opened the doors of the release aviary using a remote pulley system. Six of the twelve vultures exited the release aviary and joined the wild birds feeding on the buffalo carcass almost immediately, and all twelve came out within half an hour. Six of the birds later returned inside the aviary where they spent the night, but immediately flew out again the following morning. The release site is at the village of Pithauli, Nawalparasi, close to Nepal’s Chitwan National Park. 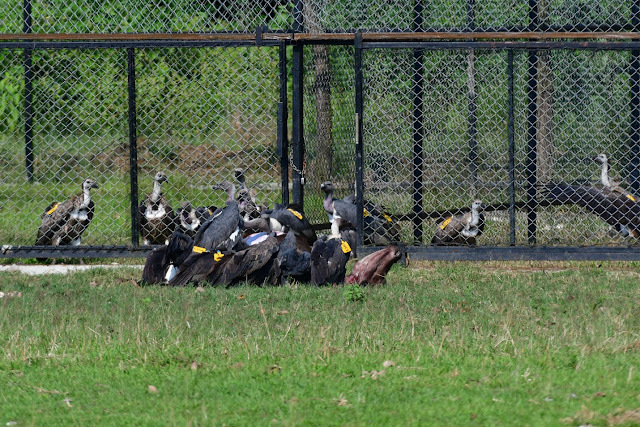 “This is a world first for the release of white-rumped vultures actually bred in the Nepal breeding centre and is a major step for establishing secure wild populations now that we are confident that the veterinary use of diclofenac has been stopped in this country” said Mr Man Bahadur Khadka, DG, DNPWC. The previous week, an expert team from the UK (Royal Society for the Protection of Birds (RSPB) and Forestry Commission) together with the BCN team had fitted satellite tags to the birds with carefully designed harnesses (using the thoracic cross-hatch method), ready so they can be monitored after the release, and give us vital information about their movements, and any problems or causes of mortality . The team also caught and tagged nine wild white-rumped vultures, which are already being monitored, to compare their movements and behaviour with the released birds. “The monitoring of the satellite-tagged birds is an important way to understand how well the birds are surviving, and to assess the safety of the “Vulture Safe Zone” said Ishana Thapa, CEO of BCN. “If these and the previously tagged birds all survive then this is a further sign that the vulture conservation efforts are working”. Krishna Bhusal, BCN’s Vulture Conservation Program Officer of BCN added: “Releasing vultures, hatched in captivity, in this location, combines our in situ and ex situ efforts to save these birds, and the process of keeping the birds in the pre-release aviary for several months before release allows them to adjust and interact with wild birds - This is an exciting day for me and all Nepal”. Chitwan’s Chief Conservation Officer, Bed Kumar Dhakal said “We are proud that the vulture breeding at the Breeding Centre in Chitwan National Park has taken off, with nine chicks last year and six more in 2018”. Jemima Parry Jones, UK birds of prey expert from the International Centre for Birds of Prey (ICBP) who advises the project said “Breeding and releasing these birds is a great credit to all involved, and shows how a combination of international and national partners can work successfully together to achieve very significant results. 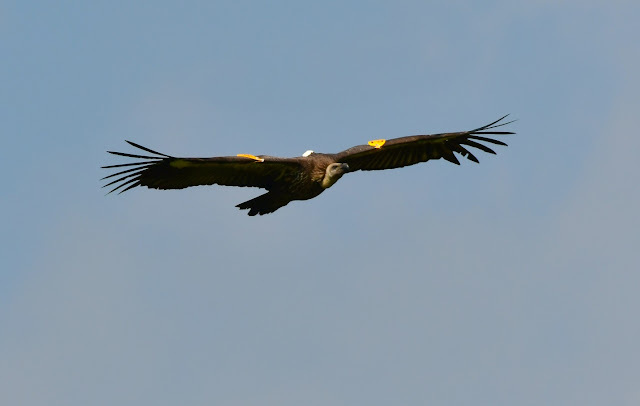 The huge success of the VSZs has meant we can have these amazing releases and aim towards all the vultures being back out in the wild by 2023”. Craig Pritchard, senior vet representing ZSL said how the birds all appeared to be in very good condition, and how pleased and privileged he felt to be part of this joint collaborative effort. 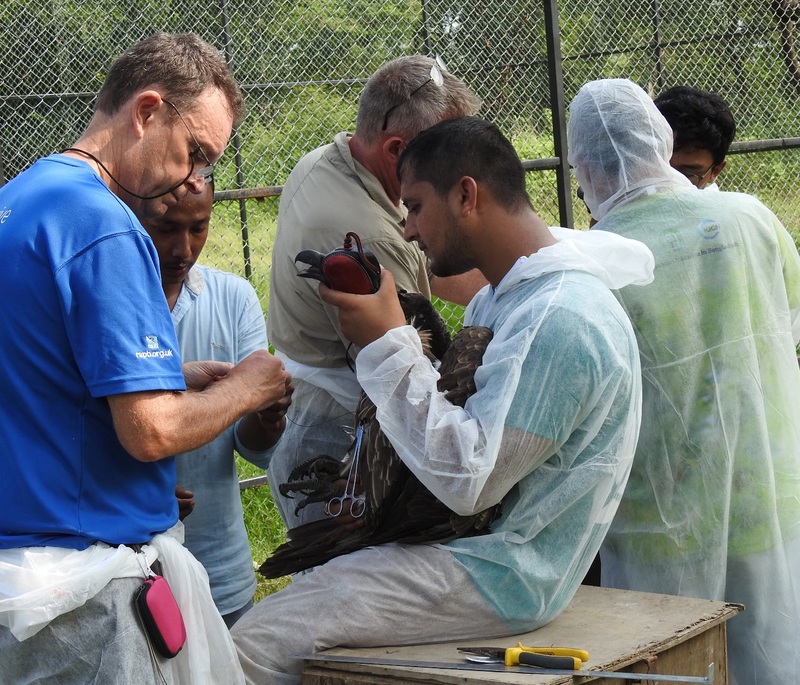 The vulture conservation work in Nepal is carried out with the full support of DNPWC, and led by BCN. The breeding centre was established in 2008 and is jointly managed by NTNC and Chitwan National Park. The main funding (and technical) support has come from the RSPB, but significant resources also come from all organisations involved as well as the Zoological Society of London (ZSL) who provide veterinary support and helped with funds for the release aviary, and the International Centre for Birds of Prey (ICBP) in the UK. Caught and tagged 5 more wild birds. • April 2018: Transferred 12 vultures from the breeding centre to the release aviaries. • September 2018: Released the first 8 captive-bred birds*, plus a further 4 captive-reared birds. Also tagged and released 9 more wild birds. • There is now a total of 37 satellite tagged white rumped vultures, 20 wild birds and 17 released. All were caught or released in Nawalparasi in Nepal. *Captive reared vultures are birds that came in as chicks collected from wild nests (in 2009 and 2010) reared and placed in the breeding centre for the breeding programme. * Captive bred vultures are the offspring of those captive reared birds, hatched and parent reared in the breeding programme. Is there any volunteering opportunity for a software engineerto contribute in wild life conservation. I am interested in any field task as well as any site developement task. Which Company Provide the Best Tempo Traveler Service? Are You Searching the Tempo Traveler Service for roaming around with a family? if yes then, you came to the right place. We (Raj Taxi Service) is available at your service. We have a Variety of Taxi/Cab like Innova/Dzire and other vehicles like Tempo Traveller on rent in Jaipur for Family Trips. We offer the 13 seaters to 23 seater tempo traveler in Jaipur. All of our Tempo travelers is specially designed for tourist comfortable journey to include ample space luggage, space for leg relief, neat clean seat cover, music system. We have a large fleet of luxury Tempo Traveler for rental tour package services. We are the best traveling services include tempo traveler rental, car rental, and Tour Package. Raj Taxi service fulfills all your need related to transport services for local sightseeing and outstation tour packages. We are ready for your customized requirement for group journey with different seating tempo traveler 9 seaters, 15 seater tempo traveler to 26 seater tempo traveler. We have Tempo Traveler on rental service in large number with luxury or non-luxury tempo traveler mode on economic prices. We are one of the most famous travel agency and trustworthy tour operators. We have a large fleet of modified luxury tempo traveler which is modified with excellent interiors. Our Luxury Tempo Travelers are recommended by many tourists of travelers because of our Luxury Tempo Traveler which we offer from Jaipur on hire. You can easy Contact with me - All you need to do is to either call +91 7425092479 or make an email info@rajtaxiservice.com or fill your need on our website form, and we will get back to you with best travel solution you require. Many IWC members send queries about wildlife conservation as a career choice. Many youngsters have great passion but find there is a lack of opportunities to qualify with an"appropriate" degree. There is also a lack of openings in general. I recently interviewed Shaleen Attre, a passionate wildlife lover. With no "Science background" she found it impossible to get admission for any environmental degree courses in India. Her vast field experience working with NGOs in wildlife area did not count when it came to admission. The tour package Golden Triangle Tour with Amritsar covered top four famous and beautiful location of India including Delhi, Amritsar, Agra and Jaipur. The Golden Triangle is perhaps the most celebrated travel path in the India that brings Indian cultural, colorful dress up, Indian tasty food and different language you will explore but with this package you will also experience the Golden Temple which Among the most prominent heritage sites in India that have made an impact in the world is the Golden Temple. Welcome India Travel offer India's most popular and selling package with affordable price and 100% satisfaction service. We offer golden triangle tour with golden temple, golden triangle with amritsar, golden temple with agra tour, delhi agra amritsar tour package price, golden triangle and amritsar tour, amritsar tour package from delhi, golden temple tour from delhi. If you are a Birdwatcher then you should definitely visit the Salim Ali Bird Sanctuary in Thattekkad. it is a must visit place for any bird photographer. You can enjoy shooting many varieties of birds which include western ghats endemics also. Special bird varieties here include Malabar Trogon, Great-eared Nightjar, Oriental Bay Owl, Ceylon Frogmouth, Black Baza and many more. You would definitely love this place. it is good for learning bird photography also. If you visit Thattekad Bird Sanctuary during winter season then you can even photograph the winter migratory birds. I have been to this place many times. If you are lucky then you can even get a sighting of the rare Legge’s hawk Eagle. Nearest railway station is Alwaye and the nearest airport is Cochin International Airport. You can arrange a taxi or cab from there to reach this place. Extended Monsoon time is on in many parts of India. Snakes are found everywhere, whether it is flooded Kerala, waterlogged Gurgaon or our many Green villages. Some avoid them, some kill them yet few think they need to be understood and protected as a species which is essential to keep the web of life intact. Snakes have territories and there is an environmentally positive reason why they are in your area. I would like all IWC members to watch a video we made recently on the topic of Indian Snakes. Shaleen Attre is a co-founder of indiansnakes.org. This website has a comprehensive database of Indian snakes. The site also gives tips on how to avoid snake bites, who to contact if you find a snake near your home and also where to get to a medical facility nearby with anti venom in case you are bitten by a snake. In her talk Shaleen demolishes many myths about snakes and says it is necessary to spread awareness and start talking about snakes if we want these reptiles to claim their place as protected wildlife of India.